Injuries can cause Trauma Reflex and Trauma Reflex can cause injuries. How? 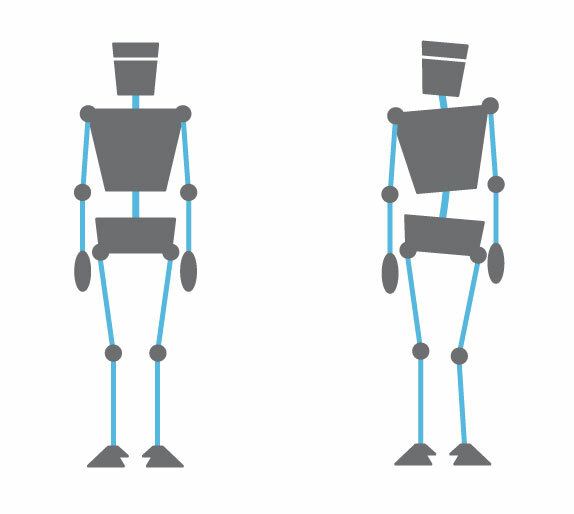 These are examples of the kinds of postural distortions that a Trauma Reflex causes. The maybe subtle or pronounced depending on the case. 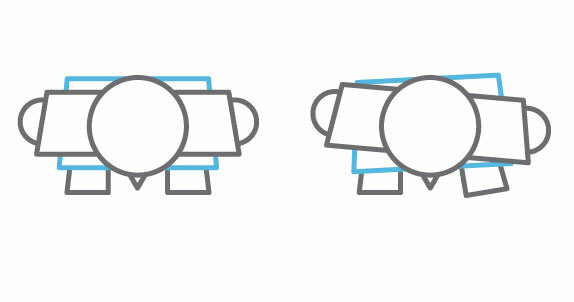 When these distortions become habituated, you are no longer in balance like the figure on the left. Even though the cuts, scrapes and bruises from your impact may have healed, your nervous system is still in injury mode. Holding one side of your body tight. If you get stuck in a Trauma Reflex you are likely to incur further injuries because your balance and symmetry have been compromised. This is due to the habituated muscular tightness in the muscles on one side of the body. Smooth gait (walking pattern) is dependant on the ability of the centre of the body to be relaxed, and able to rotate freely. If you cannot fully lengthen one side of your waist and allow your spine to rotate freely along its axis, your gait will not be smooth or balanced. You will walk with more weight on one side, this can lead to one sided back, hip, knee and ankle pain as one side of your body must work harder than the other. This is easy to visualise when you look at the figures above and imagine those same asymmetries in motion. These asymmetries also lead to increased ‘wear and tear’ in the joints of the affected side which over time can lead to structural problems within the joints themselves. Trauma Reflexes are also the cause of many alleged leg length discrepancies. The short side waist creating a false ‘short’ leg. When Trauma Reflex is accompanied by Green Light Reflex (which occurs often), we begin to see complaints like Sciatica, and Plantarfasciitis developing due to th habituated muscular tightness on one side plus habituated tightness in the back of the body. Trauma Reflex can also develop in more innocuous ways. For example slouching to one side as we sit at a desk and use a computer mouse for hours at work. Or holding a baby on one hip for long periods repeatedly. The end result will be the same, the loss of the ability to lengthen the waist muscles on one side of the body and, over time, mysterious one sided pains in the body. So in this way, an injury can lead to Trauma Reflex and a Trauma Reflex can lead to further injuries. If not addressed it can become a vicious cycle of injuries and pain. You get the picture. Fortunately, it is quite simple to eliminate a Trauma Reflex with Somatics, either via Clinical Hands On Sessions or Somatics Self Care Exercises. Somatics teaches you how to pandiculate the affected muscles, restoring the brain’s control of those muscles and simultaneously lengthening them back to their correct resting length. The end result is softer, more relaxed muscles a smooth gait and a body that is in balance and capable of equal right/left movement in all directions. One of the core principles of Clinical Somatic Education is the emphasis on eliminating SMA and regaining and maintaining proper control of the muscles of the centre of the body first. Good awareness and control of the central muscles of the spine, torso, shoulders and hips facilitates free movement and optimum functioning of the arms, hands, legs, ankles and the neck. When we look at the musculature involved in the Green Light, Red Light and Trauma Reflexes, we can see that they primarily affect the centre of the body. The image above illustrates this clearly. Green Light Reflex affects all the muscles of spinal extension, plus the extensors of the hips and legs (glutes, hamstrings, calves etc.). 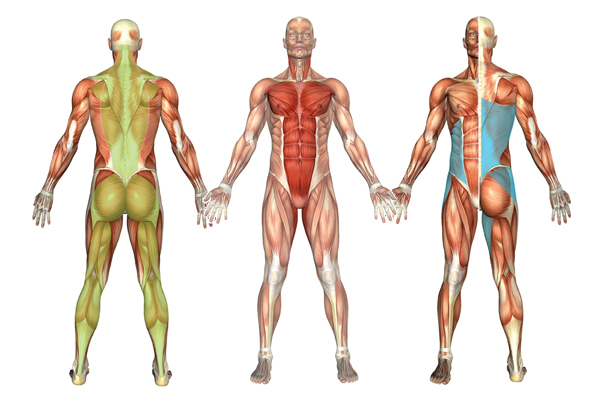 All these muscles are found on the back of the body. Red Light Reflex affects the opposing muscles of spinal flexion on the front of the body (abdominals, pectorals etc). Trauma Reflex affects the muscle of lateral flexion and rotation of the spine (obliques, lats, quadratus lumborum etc.). If we develop an habituation of any or all of these Three Reflexes, our ability to sense and move the centre of our body is diminished. When we can’t move our centre our movement in general diminishes. Our spine cannot bend, cannot reach and cannot twist. This leads to problems in the extremities, as the shoulders, hips, knees and ankles have to compensate for the diminished movement potential in the centre of our bodies. Could a painful knee be the result of an habituated Trauma Reflex? Or a tight neck and shoulders and an inability to reach both arms overhead stem from the Red Light Reflex? Or tight hamstrings and an inability to touch your toes due to Green Light Reflex? These are just some examples of what can happen as a result of the Three Reflexes. It is worth remembering too that most people will present with all Three Reflexes to some degree. Habituation of these reflexes develops through stress, trauma, repetitive actions or lack of movement and leads to SMA, a reduced ability to move well and over time, muscle pain. So what’s to be gained by eliminating SMA and learning how to relax and release all the muscles of the Three Reflexes? First of all maintaining optimal freedom and control in the muscles of the spine allows the major nerve roots exiting and entering the spine to send information back and forth from brains to muscles uninhibited. If the spinal muscles are too tight or in spasm, they can compress the nerves and cause pain and dysfunction in the back and associated limb. Free, relaxed spinal muscles also allow all the individual vertebra to articulate individually. The end result of this is a spine that can flex, extend and rotate freely and comfortably without restriction. Another benefit of freeing the centre of the body is effortless breathing. When the chest and abdominals are free and relaxed, breathing is uninhibited, the rib cage and lungs within are free to expand without restriction. 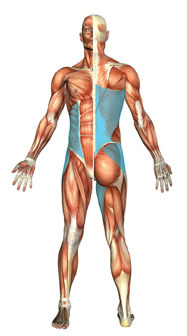 When the muscles of the waist are released and fully controlled the ability to flex laterally (side bend) is restored. Suddenly you can reach to the top shelf with ease. When the centre of the body is free you will be able to twist, bend, flex and extend like a child. This type of control and freedom can be easily maintained and endlessly improved upon with a simple, enjoyable daily Somatic practice.